Looking for even more power and performance? Industrial M Series Sandblasting Cabinets are the most powerful and sophisticated cabinets available on the market today. Built with strong 12-gauge steel and equipped with cutting-edge technologies, the Industrial M Series can accomplish any heavy-duty tasks you can imagine. Fully customizable in sizes and configurations, Industrial M Series cabinets are delivered with powerful DCM Series high-efficiency impeller dust collector and tunable media reclaimer. For better ergonomics and performance, various optional features can be added. 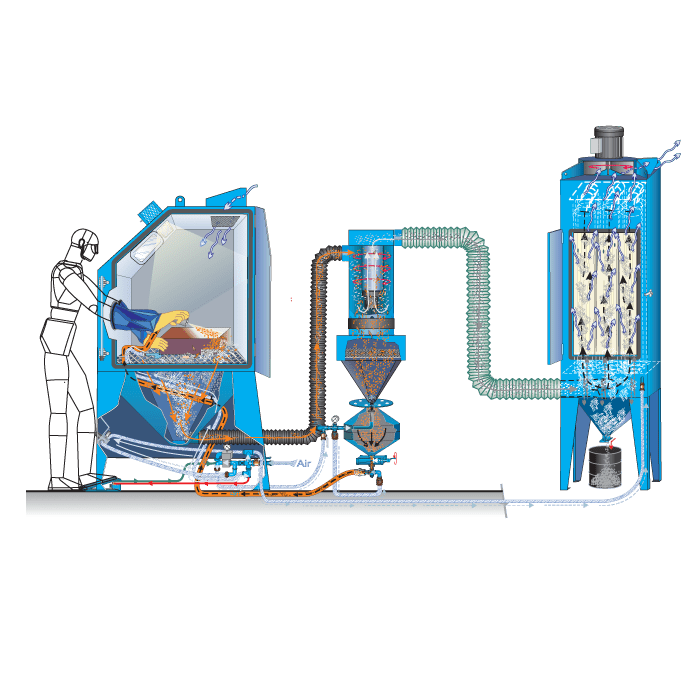 Depending on your application, you can choose between two systems to reach the best output and lower your operation costs. An economical suction-type cabinet is ideal for everyday maintenance and light-duty jobs. Compressed air (released by operator pedal or trigger gun) enters gun and creates a vacuum that draws and expels abrasive onto the workpiece. Blasting uses the Venturi principle of sucking media from a hopper. 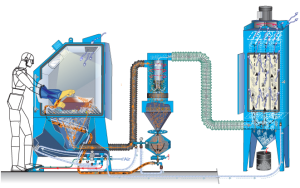 Air jet diameter is half the interior diameter of the nozzle and, as the air stream passes through both, it creates suction which pull the media from the hopper into the air stream. Media acceleration distance from nozzle to workpiece is short (approximately 4 to 14 inches). 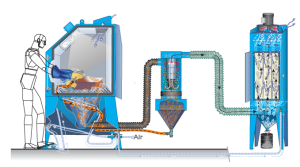 The suction system works fine and can continuously blast as long as there is blasting media in the hopper. However, suction systems have limits on suction capacity and propelling heavier media. Very heavy blasting media (larger steel media) cannot be conveyed into air stream with suction blasting. Nonetheless, most industrial blast cabinets use suction systems due to their lower cost and because they work well for most applications. 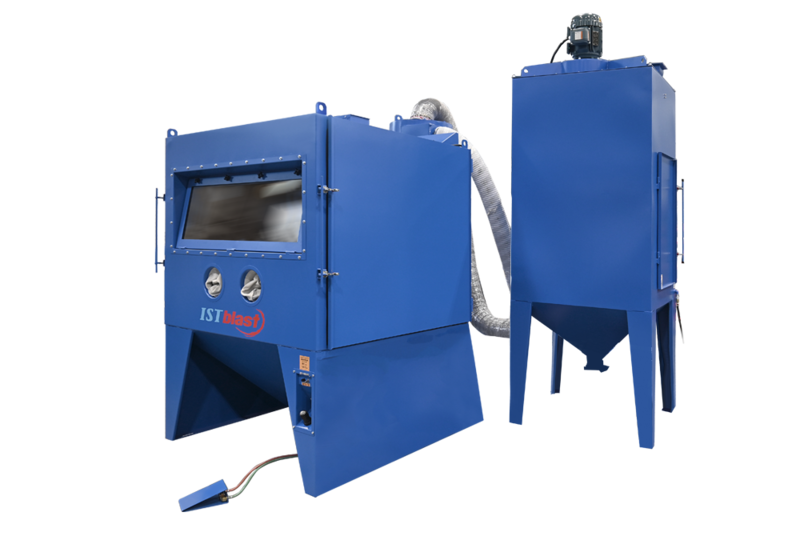 For rapid results in hard-to-reach areas, high performance pressure-type cabinets have 1.3 cubic foot pressure vessel that forces media through blasting hose and nozzle. The pressure pot contains media that pressurizes the pot as it is energized with compressed air. When air/media mix is released from the pot, it accelerates through at least 5-10 feet of hose and then picks up even more speed as it travels through the Venturi of the nozzle. The acceleration rates of air/media mix are much higher in pressure blasting than suction blasting. When pressure pot empties of media, it must be depressurized to be refilled with media. 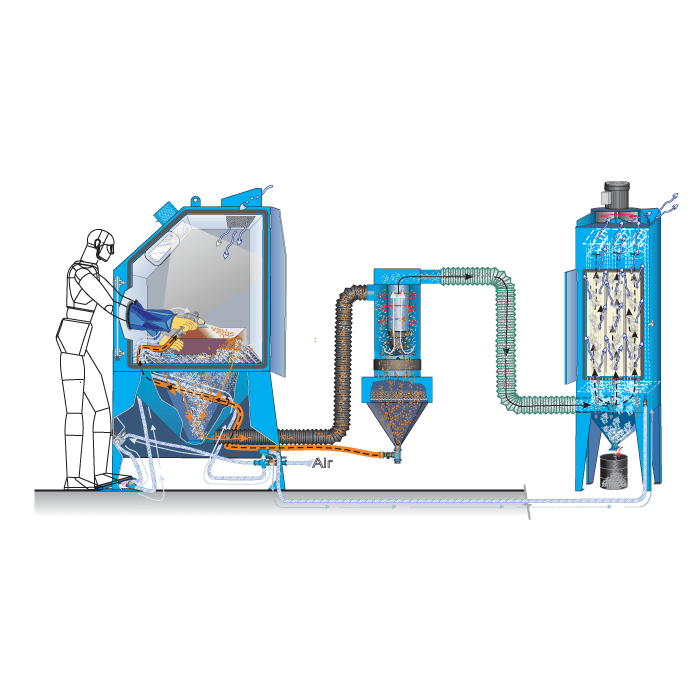 Pressure blasting systems are much more productive than suction systems. Additionally, pressure systems can blast all types of media regardless of weight or size, but require a minimum of 25 psi to operate.